It’s not enough to just serve great food these days, every restaurant needs an engaging website to be noticed. Customers like to check out menus, read reviews and have the option of booking a table online before they visit. Luckily, you don’t need to be a design pro to create beautiful, user-friendly restaurant web designs, as there are plenty of great WordPress themes that will do the job for you. We’ve put together a list of the top 10 options. Not sure how you want your website to look? Then Sage is a great option for you as there are over 40 demo sites to choose from covering everything from Seafood, Vegan and Thai to Bakery, Brewery or Tea House designs. Once you’ve selected a demo you can use the theme options panel to easily customize the design to suit your restaurant. 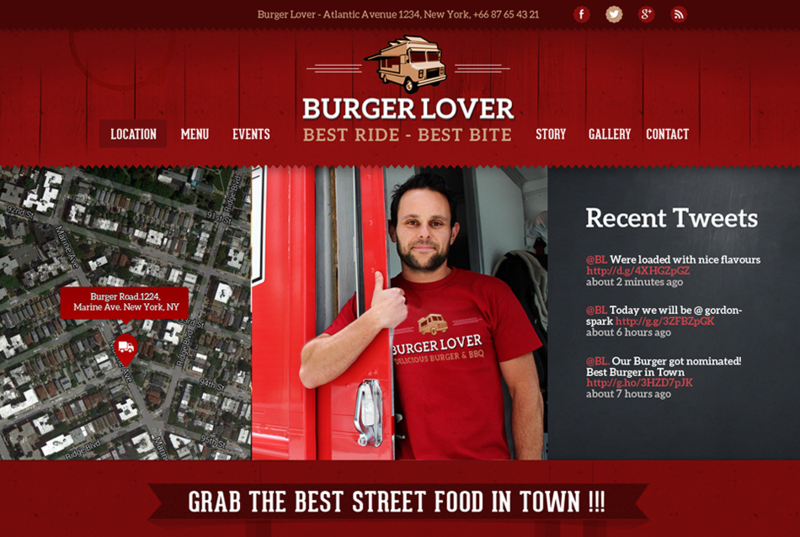 This is the ideal theme for street vendors, food truck owners or small food businesses. Food Truck incorporates simple page and menu builders and is easy to tweak, including nearly 90 custom shortcodes, 10 widgets and over 600 Google Fonts. However, this theme’s key selling point is its truck locator map, which allows customers to find you easily. Resca is one of the top restaurant website themes and looks great on all devices. Choose from one of the demo sites and make it your own by selecting from hundreds of colors, skins, fonts and icon options. Resca’s star attraction is its events calendar which will keep your customers in the know. 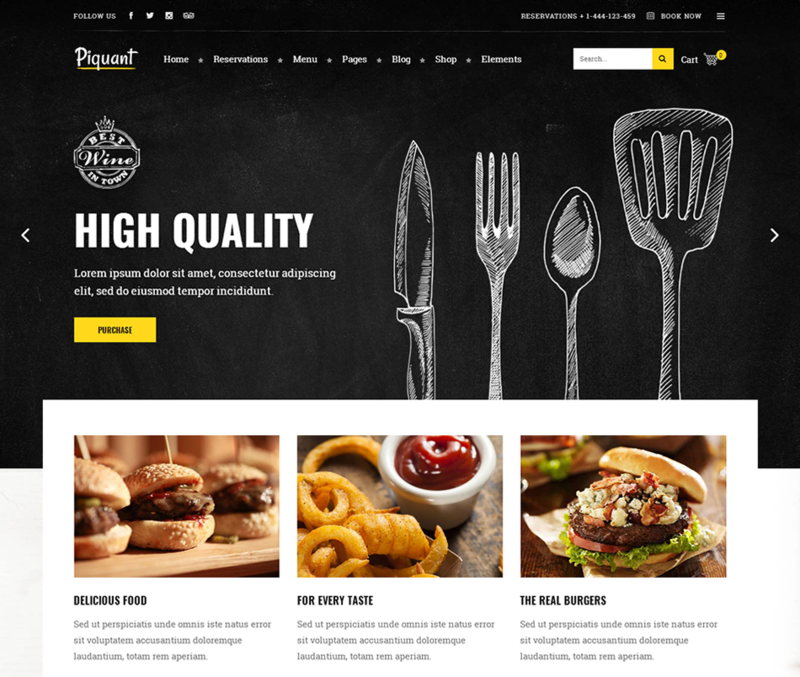 Tavern is one of the most popular WordPress themes for pubs and restaurants. It includes well-known plug-ins like Revolution Slider, Essential Grid and Visual Composer, all of which allow you to create any site layout. You can drag and drop pre-built features to customize your design and improve the user experience with a reservation/booking system and online shop. If you’re in the fine dining sector or run a high-end eatery such as an Italian Bistro, then Luigi is the classy restaurant theme for you. The theme boasts a Hero Block feature which allows for full-width images and customizable titles, text and fancy call-to-actions. 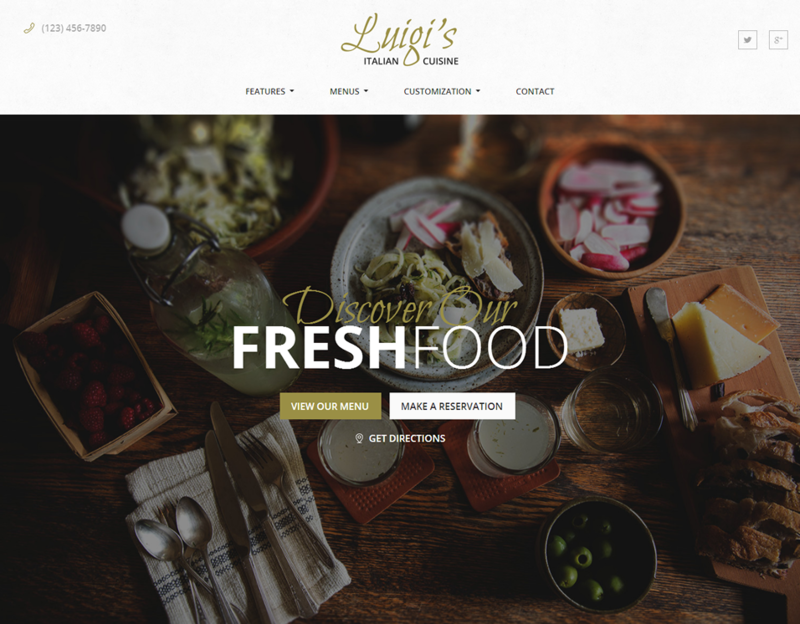 Luigi also has an online table reservation system, event organizer and GoodReviews plug-in so customers can let everyone know how great your food is. 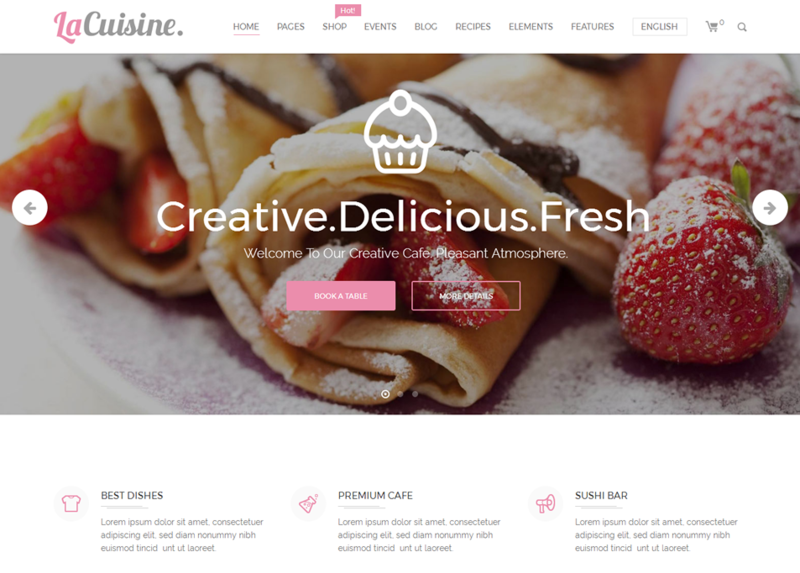 LaCuisine is a clean, ultra-responsive theme suitable for any type of eatery. Start with one of their stylish demo sites and edit to suit your style with the hundreds of fonts, colors and layout options. LaCuisine’s key features include sharp, retina-ready graphics and an engaging menu builder which allows diners to click on dishes and leave a review or pre-order them. This is an extremely visual theme that offers unlimited color, layout and sidebar options. Nuvo will help you create a site full of Parallex full-screen images and video backgrounds; you can also choose from a huge range of animations and typography. 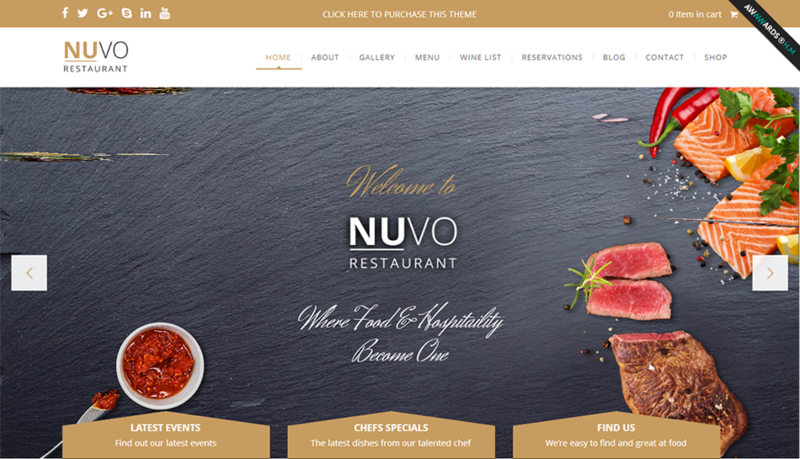 Nuvo is easy to personalize and works well for restaurants, cafes and bistros, however, the theme does looks better on larger devices. 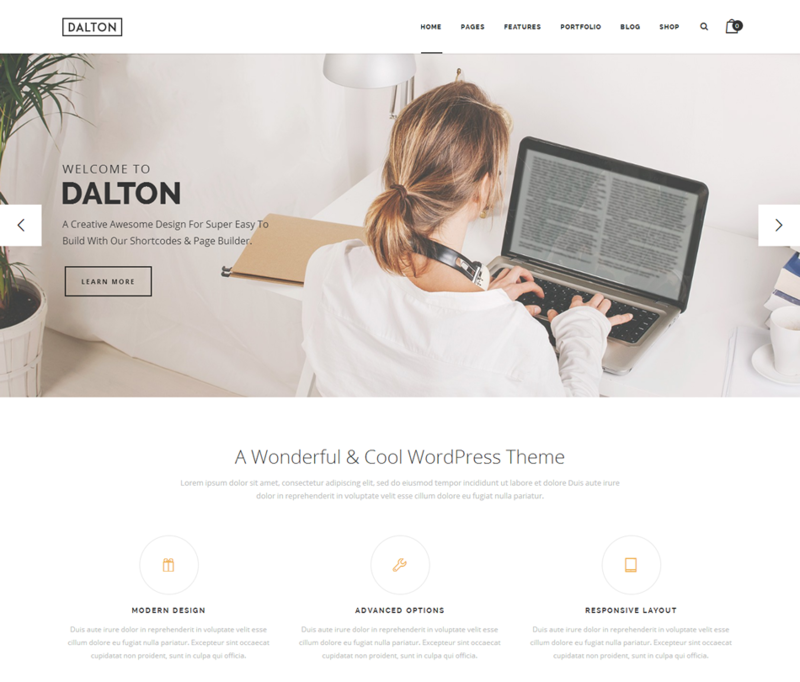 Dalton is a multi-purpose, corporate theme that works well for restaurants as well as other types of businesses. It has six unique homepage designs to start with and over 55 customizable page builder elements, as well as stunning Parallex and retina-ready visuals. This theme uses the Slider Revolution plug-in for smooth scrolling, perfect for websites with lots of images. Piquant offers a simple, bold design and six homepage styles. There are customizable menus, clever call-to-action buttons and awesome image galleries. The stand-out feature of Piquant is its blog function which has six different post templates, so if you’re serious about engaging with your customers and updating them on new dishes and events, this is a great theme to choose. 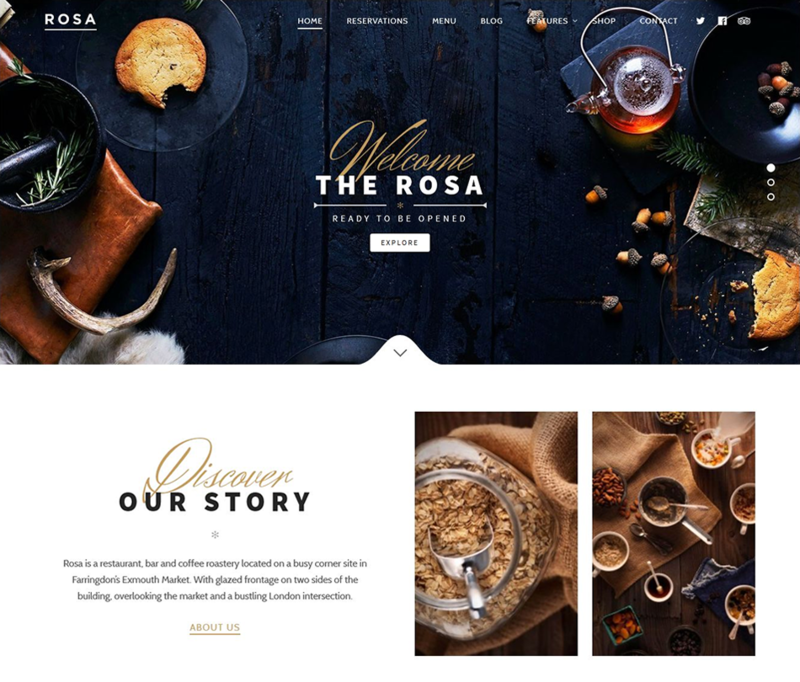 Rosa is great for restaurants, cafes and bakeries and is a popular bar website theme. If you want to focus on high-end images Rosa is a great choice as you can create stunning galleries, Parallex visual effects and video. The theme also has handy booking and e-commerce capabilities. Investing in a top restaurant theme for your website is one of the smartest moves you can make. Rather than battling with web coding, save time and hassle by choosing a ready-made theme and simply modify it to reflect your restaurant’s unique personality. Don’t forget to make use of your theme’s special features to improve user experience, including table booking, e-store and online review plug-ins. Build a stunning menu and pack your site full of enticing food images and your restaurant will be buzzing in no time! 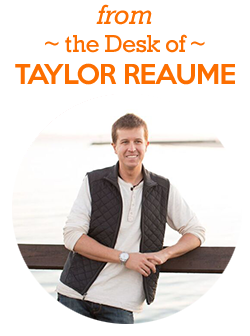 About the Author: Taylor Reaume is a fortune 500 web marketing consultant from Santa Barbara, CA and founder of Search Engine Pros, a full service web marketing agency providing a range of web marketing services, including social media consulting, top web design, custom WordPress, web programming, and marketing SEO services. Visit the website at http://TheSearchEnginePros.com for a complimentary Google rank analysis. “Like” the Facebook page for regular insights on WordPress SEO. Call 800-605-4988 to request a complimentary copy of 101 Ways to Drive Traffic. Posted on July 13, 2017 July 13, 2017 by Restaurants ProPosted in RestaurantsTagged custom Wordpress, internet web marketing, marketing agencies, marketing agency, marketing consulting, marketing expert, marketing group, marketing plan, marketing seo, marketing service, online marketing, online marketing plan, search marketing, seo companies, seo marketing, seo services, seo services company, SEO Tools, social media consulting, social media marketing, top Web Design, top Web Designers, top Wordpress Plugins, top Wordpress Themes, web marketing, web marketing agency, Web Programming, Wordpress CMS, wordpress Plugins, Wordpress SEO.